If you’re a Mac & Cheese fanatic than you haven’t lived ’til you’ve tried the one and only Bebo’s Mac Shack. The mobile eatery works its way around Charlotte so whenever you get that urge for the ultimate comfort food they’re just around the corner. Had a chance to stop by Rocky’s located at 10310 Wilmington Street in Huntersville. 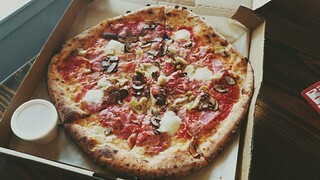 We were on our way back from a nice hot day in Cornelius and had pizza on our minds. I hadn’t heard of this particular pizza joint, but the mood was there so the short detour off the Highway 77 was a no brainer. It was time to start off our Memorial Day weekend and we decided it was Pizza, not BBQ, that was needed. So, after a visit to a local brewery we headed east to Inizio Pizza Napoletana (Map) just to see what all the hype was about.